"If Janus Had Two Faces, Then Why Can't I?" in Fiction International 52: Body, ed Thomas Gresham and Harold Jaffe, Fiction International, 2019. "AuthorSoft tm" in Ellipsis Zine Three, ed Steve Campbell, Ellipsis Zine, 2018. 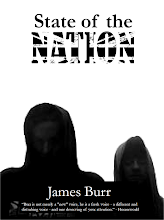 "Marks on a Page" in Flash Flood: The National Flash Fiction Day Journal. ed Calum Kerr, 2017. - http://flashfloodjournal.blogspot.co.uk/2017/06/marks-on-page-by-james-burr.html and also in Wired eds. Calum Kerr, Lindsay Stanberry-Flynn, Black Pear Press, 2017. "MWC ISO RL" in Wired, eds Calum Kerr, Lindsay Stanberry-Flynn, Black Pear Press, 2017. (Also shortlisted for the 2017 Worcestershire Literary Festival Flash Fiction Competition). "Genuine Photo" in A Cache of Flashes, eds. Calum Kerr, Lindsay Stanberry-Flynn, Black Pear Press, 2016. (Also shortlisted for the 2016 Worcestershire Literary Festival Flash Fiction Competition). "The Girl Within" in A Cache of Flashes, eds. Calum Kerr, Lindsay Stanberry-Flynn, Black Pear Press, 2016. "The Doll's House" in Fifty Flashes of Fiction, eds. Calum Kerr, Lindsay Stanberry-Flynn and Emma Lannie, Black Pear Press, 2014. "Blue" in Darkness Rising 2003, eds. Len Maynard and Mick Sims, 2003. "Ménage a Beaucoup" in Darkness Rising 2003, eds. Len Maynard and Mick Sims, 2003. "Life’s What You Make It" in Ideomancer, www.ideomancer.com, ed. Amber Van Dyk, 2002. "Fragments of a Schizoid Dream" in Darkness Rising 3, eds. Len Maynard and Mick Sims, 2001. "Bernie Does Camberwell" in Suspect Thoughts, www.suspectthoughtspress.com, ed. Greg Wharton, 2001. "Foetal Attractions" in Roadworks: Winners Issue 2000, 10, ed. Trevor Denyer, 2000. "It" in Planet Prozak, 6, ed. Stephen. E. Bennion, 1999. "Blot" in Raw Nerve, 7, ed. Darren Floyd, 1998. "Mutton Pie" in Strix, 7, eds. Sue Phillips and Anne Franklin, 1997. "The Eye of the Beholder" in Purple Patch, 85, ed. Geoff Stevens, 1996. Burr, J. 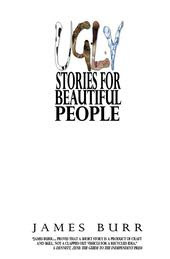 (2007) Ugly Stories for Beautiful People, Worcester, Corsega Press. Shortlisted for Worcestershire Literary Festival Flash Fiction Competition 2017. Shortlisted for Worcestershire Literary Festival Flash Fiction Competition 2016. 2nd Place in the Roadworks Winners 2000 Competition.